This time of year I lean towards eating something warm for breakfast. One of my favorites is good old fashion oat meal. When I was little I would always have the instant oats out of the package, maple and brown sugar for me, always. But ever since college I have taken to making the oats from scratch on the stove top. Recently I have come up with a little twist to my oatmeal, not just to change it up and add a little variety, but also to start the day with a meal packed with protein and nutrients. It fills me up and helps me to get a good start on the day. I don't know about you, but for me breakfast is absolutely mandatory in my book. I am very particular about when I like to eat my breakfast. Not first thing in the morning when I get up. I like to get up and have my tea and get started with my day, and then I will sit down to breakfast a while later. 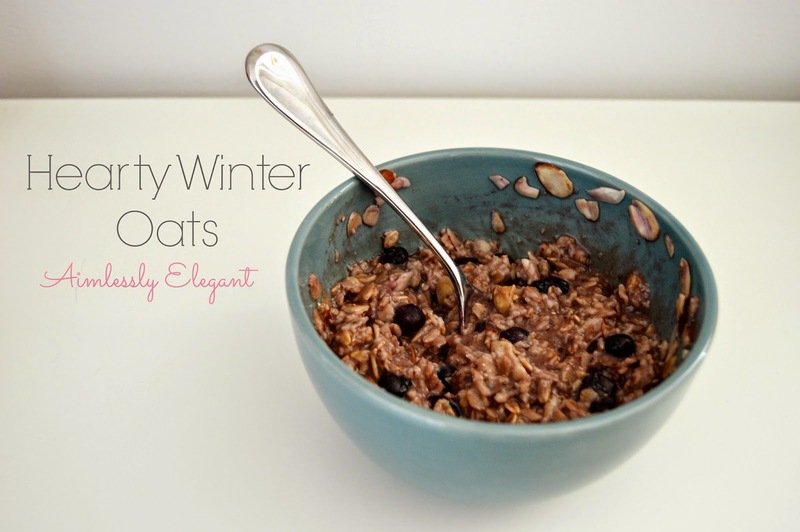 These hearty winter oats have been an easy to go for me on most mornings lately, and I imagine it will stay that way for the winter months to come. Start with preparing a serving of rolled oats. My favorite are Trader Joe's Rolled oats, they come in a large light blue bag. I just use a small saucepan with 1 cup of water and 1/2 cup of oats. Bring it to a boil, stirring occasionally, let it simmer until it reaches the consistency you desire. Once the oats come to a boil it usually only takes a few more minutes. While to oats are cooking I pop about a 1/2 cup of frozen berries in the microwave for about a minute. Above I used blueberries, but my favorite are raspberries. Really you can use any fruit your heart desires. Once your oats are done, transfer them into your bowl. Dump in your defrosted fruit, juices and all. And now it's time to load up the oats with the rest of the good stuff. The best part is there is no need for any exact measuring, and you can easily tweak the ingredients to your liking. I add in a little pure maple syrup, a few shakes of cinnamon, a dash of vanilla extract, a sprinkle of some chia seeds, and top it off with some almond slices. I really like the texture that the almond slices give to the oats, it makes it seem a little bit more substantial. Finally, for that added protein I throw in about a teaspoon of protein powder. I have been using this one by Nutribiotic. It's a rice protein powder, made with no chemicals or dairy. I found it at my local Vitamin Shoppe. I'm typically not a big fan of protein powders, but I've just been sprinkling in a little here and little there, and I like the little added boost and staying power it gives the meal. Once you have everything together in the bowl, just stir it so it is all well blended together and enjoy! What's your favorite winter breakfast? Ha! I just got done eating oatmeal for breakfast! I may have to try your version! It's seriously so good! And the best part, maple syrup is good for us trying to avoid sugar! I discovered a dangerous alternative yesterday morning, I wasn't feeling the berries so I threw in some chocolate chips, it was SO good! These is a good easy alternative, hope you give it a try!